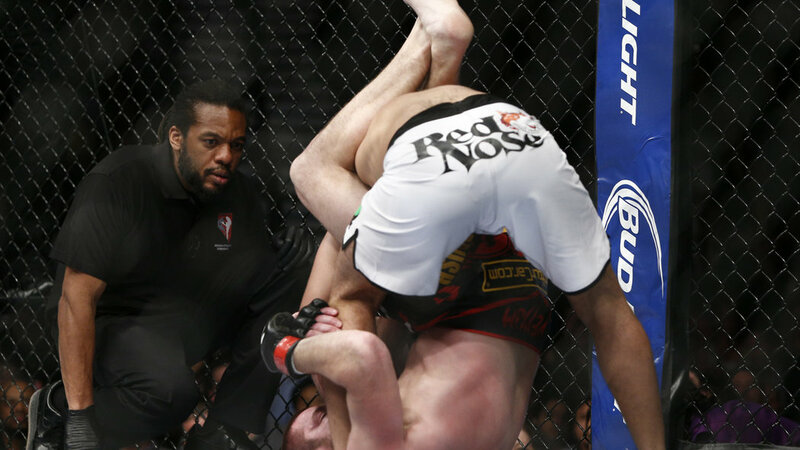 Jim Miller pulled off a big first round submission on BJJ black belt, Fabricio Camoes at UFC 168. Some even say the unorthodox rubber guard/gogoplata set up was the submission of the night. Camoes goes for a right head kick, Miller catches it in the crook of his arm drives Camoes backwards and reaps out his other leg. Camoes shows great hip movement to get out from underneath Miller’s ground and pound, utilizes a safety stand-up. Miller immediately senses his back is exposed and hooks the close leg, drags Camoes down, throws his right leg over in an attempt to take his back. All the while Miller keeps control by grabbing around Camoes right lat/armpit to attempt to stay on his back. Miller ends up in Camoes guard after trying to take his back and immediately starts working for rubber guard control. Note: Interestingly Miller uses his same side hand to reach for his shin. This may be in an attempt to go for the gogoplata, though typically you will see fighters reach for their shin with the opposite hand. This time Miller is able to get his shin all the way under Camoes’ chin in an attempt to choke. Camoes realizes it right away and pulls away but Miller is ready for this immediately transitioning to the armbar from guard. Camoes attempts to stand up and Miller hooks the near leg to prevent Camoes from pulling his arm out eventually locking the arm and getting the submission win. Which was your favourite armbar setup from UFC 168, Miller or Rousey? Post in the comments below! Rousey, simply because Tate knew it was coming!